Ecolibrium is the official journal of AIRAH. It is is the most influential HVAC&R publication in Australia. A high-quality gloss magazine, it’s professional, bright and informative; offering in-depth news on the latest technologies, case studies, peer-reviewed technical papers and informed editorial. 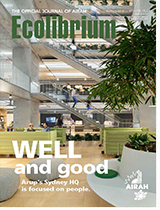 Ecolibrium is direct-mailed to AIRAH members and non-members Australia-wide. The magazine reaches chief executives, managing directors, engineering managers, business development managers, senior mechanical engineers and consulting engineers. Ecolibrium has a readership of 22,515*. Click here to access older past issues. Only AIRAH members can access the past issues. 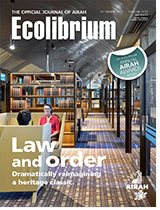 Ecolibrium is sent free of charge every month to all AIRAH members. Become a member today. If you're interested in advertising in Ecolibrium, please visit the Advertise webpage, or contact one of our advertising executives (details below). Got an idea for a story for Ecolibrium? We would love to hear from you. 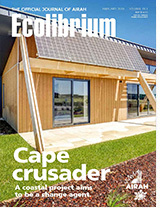 To submit a story, complete Ecolibrium article proforma and send to the editor. AIRAH is always seeking technical papers of merit for publication in Ecolibrium. Technical papers must comply with the technical paper guidelines. All papers submitted for publication in Ecolibrium are required to undergo a peer review process. Once submitted, the paper will first be reviewed internally, before being sent to two independent external reviewers with relevant expertise. At each stage of the process, comments and recommendations will be sent to the author for alterations as required. If the paper passes the review, it will then be eligible for publication in Ecolibrium.